An associate professor of the Central University of Jharkhand has been suspended for having invited Prof MN Panini, a retired JNU academic, to be the guest of honour at an event to commemorate the 140th birth anniversary of Sardar Vallabhai Patel. The suspension order issued to Dr Shreya Bhattacharji by CUJ vice chancellor Nand Kumar Yadav on Tuesday said: "...Dr Shreya Bhattacharji invited Prof MN Panini from JNU as guest of honour for the said celebrations on March 19 without prior permission from the office of the vice chancellor. Prof Panini is considered as mentor to the group of students of JNU who were involved in anti-national activities on JNU campus recently." Bhattacharji, dean of the school of languages, dean of the school of education and dean of students' welfare, has been relieved of all her responsibilities at CUJ, says The Telegraph. She also cannot leave the university in Brambe without the permission of vice chancellor Nand Kumar Yadav. Nand Kumar Yadav said that he was aware Prof Panini had been invited to the event, but had been unaware of his credentials. "A few days before the event, I got flooded with emails, SMS-es and calls demanding that Panini's visit be cancelled as he had been the mentor for Kanhaiya Kumar and his group of friends in the past. Until then, I didn't know anything about his credentials. Many even threatened to show black flags if Panini came to CUJ. So, I couldn't take any risk and cancelled his tour," he said. According to The Indian Express, Prof. Bhattacharji's suspension order also said that the invitation to "a person of disputed integrity" had led Jharkhand's governor Draupadi Murmu to cancel her own participation at the event as chief guest. Prof. Panini said about the issue that he had received a phone call from Nand Kumar Yadav two days before the event, and was told the event was being cancelled. Panini said: "He only said that there was some agitation by students, which is why they were cancelling it. I probed and asked him if it was because I was from JNU. He said 'Yes. 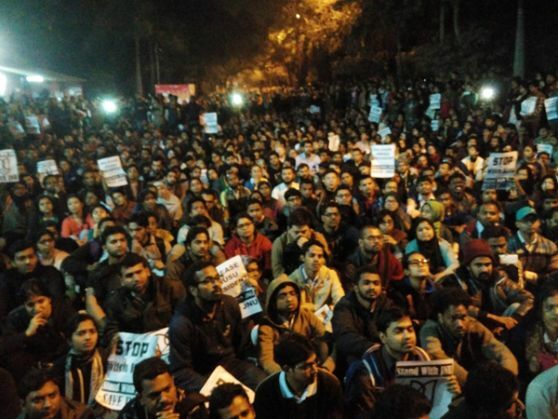 There's nothing personal against you but it's because you are from JNU'."